Saturday, May 18, departing at 8:00am (7:30am from the subway). Cost: 430 RMB (390 RMB for members); Difficulty Level 3+. In Brief: Walk through chestnut orchards to find a dirt trail that climbs up to the unrestored wall; follow the wall through unrestored and restored sections, making a big climb up to a lookout point high on a ridge. Coming up to a tower on the unrepaired part of the Great Wall at Huanghuacheng. We start off near a walled village that was once an army barracks during the Ming Dynasty. The tall and thick stone walls remain, and it’s possible to explore inside. Surrounding the village are fields and chestnut orchards, the main source of income for those who live nearby, and in the hills above the village runs a stretch of the Yellow Flower Great Wall. We’ll follow the villagers’ field trails up into the hills, passing the chestnut orchards on the way to the narrow hill trail that will take us up to the Great Wall. It’s here where the trail gets steep for the first time on the hike, with a good climb up the zig-zagging dirt path that leads to the wall. This first stretch of wall that we’ll see is unrestored and hasn’t been touched since the Ming Dynasty. Parts of it are in good shape, and other parts are tumbled-down and in rough condition. We’ll follow the wall east, passing through towers and using side trails to skip broken down sections. After 45-50 minutes, we’ll be on to the restored section – a good chance to see what the wall might have looked like when first built. A climb down a steep set of stairs takes us to a big arch in the wall, and we’ll take a break to catch our breath before another steep climb. From this point, we’ll be on repaired Great Wall. After a rest, it’s onward and upward, with another 45 or minutes of climbing to get to the highest point on the hike, a lookout point that offers 360° views of the surrounding countryside and more of the wall. Below, we’ll see a local reservoir. The wall leads down to the reservoir, and back up the hills on the other side. We’ll follow the wall down to the last tower before the reservoir, and then exit to take a path down the hill, passing small guesthouses on the way to the road and the restaurant where we’ll have a big meal before heading back to the city. There’s one really steep descent on the first part of the restored section, with narrow steps, no parapets to hang on to, and a view all the way down to the bottom about 20 metres below. We hiked up from the Walled Village and followed the Great Wall over to the Huanghuacheng Reservoir—a fun day of hiking! See 19 photos. We hiked the Huanghuacheng Great Wall to see the last sunset of 2018—take a look at 16 photos from the hike. 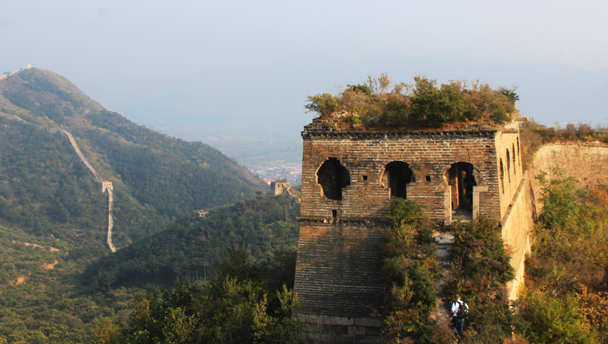 See a set of 17 photos from a hike from the Walled Village to Huanghuacheng Great Wall—blue skies and autumn colours. See a selection of photos from a hike at the Huanghuacheng Great Wall—23 photos of Great Wall, blue skies, autumn colours … and an Ofo bike?! Twenty-five shots from a hike on the Great Wall at Huanghuacheng—plenty of sun, and relatively mild weather for the middle of winter. See 15 photos from a walk on the Great Wall at Huanghuacheng—blue skies, lots of sunshine, and great views of the Great Wall. 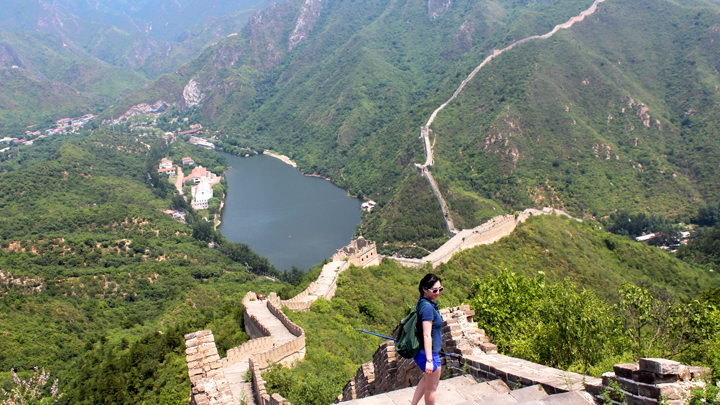 Twenty-nine photos from a blue-sky day hike on the Huanghuacheng Great Wall. 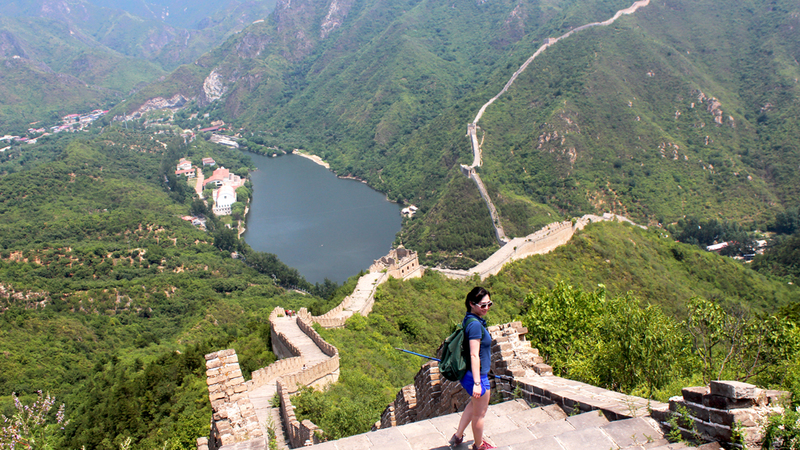 See 14 beautiful photos of a hike to the Huanghuacheng Great Wall – blue skies, green hills, great views. Fourteen photos from a hike from the Walled Village to the Huanghuacheng Great Wall. See 17 photos from a early-autumn visit to the Great Wall at Huanghuacheng. This hike started at a village that dates back to the Ming Dynasty (1368-1644AD). This village is completely surrounded by a thick protective wall and is full of courtyard houses in various states of repair. From there, we walked up to a nearby stretch of Great Wall and followed it over to Huanghuacheng, taking photos along the way – click through to take a look!